There are many different options in terms of engine. The Veloster 2.0 has a two-liter, four-cylinder engine. 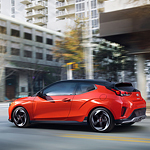 The Veloster Turbo and R-Spec trims have a more powerful engine that gives them 201 horsepower versus the 147 in the standard trim. They run on a turbocharged, four-cylinder model that has a displacement of 1.6 liters. If you want even more kick, consider upgrading to the Hyundai Veloster N. This high performing vehicle uses a turbocharged engine that's a two-liter, four-cylinder model. With 275 horsepower, this choice would be the way to go if you love the feel of acceleration.